BEIJING - China, the world's largest producer of rare earths, maintained its export quota at almost the same level as last year, a move analysts said will ease global supply fears. The Ministry of Commerce said on its website on Thursday that rare earth export quotas for 26 companies in the second half year of 2011 will be 15,738 tons. That means the full-year export quota will be 30,184 tons, almost unchanged from last year's 30,258 tons. The announcement was made as top trade officials from China and the European Union held talks in Beijing. A World Trade Organization (WTO) expert panel ruled, two weeks ago, that China's export restrictions on nine raw materials were inconsistent with its WTO obligations. The raw materials cited in the WTO ruling did not include rare earths. Some countries raised concerns about China's export restrictions on rare earths. The government has promised to keep the export quota at reasonable levels to conserve the precious resources and protect the environment. China produces more than 90 percent of the world's supply of rare earths, even though it has just 36 percent of global reserves. Rare earths, a group of 17 minerals vital for high-tech industries, are used in electronics, defense and renewable energy. Export quotas were reduced by 11 percent for the first batch of rare earths this year, after they were slashed 30 to 40 percent in 2010, in a bid to protect sustainable development. The country is committed to providing a stable supply for the international market, said Wang Caifeng, a former official at the Ministry of Industry and Information Technology and a key player in establishing a rare earths industrial association. She said the export quota is in line with the country's production plan. China produced more than 120,000 tons of rare earths last year, with 87,000 tons for domestic use and 34,600 tons for export. The production quota this year is expected to grow by 5 percent, she said. 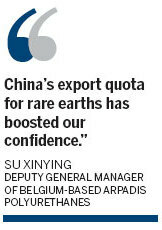 Su Xinying, deputy general manager of Belgium-based Arpadis Polyurethanes, a company that specializes in the supply and sale of raw materials, said: "China's export quota for rare earths has boosted our confidence." Although rare earths were not in the nine materials covered by the WTO ruling, analysts believed the case could serve as a precedent to take China's restrictions on rare earths exports to the WTO. European Union Trade Commissioner Karel De Gucht said on Thursday that the EU wants to see the principles that guided the WTO panel in making the judgment on raw materials also applied to rare earths. 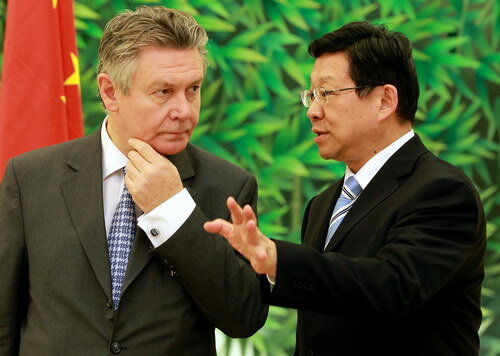 However, Chen Deming, minister of commerce, said at a joint news briefing with De Gucht that he was not concerned about possible WTO challenges to Beijing's policy on rare earths. The extraction of rare earths has caused environmental damage in China and rampant mining has diminished supplies. This led to the introduction of policies to guard against over-exploitation and since 2009 export quotas have been cut. Prices for the minerals on the international market have started to rise recently and "will remain high as demand is there", Wang Caifeng said. China's rare earth consumption stood at 87,000 tons in 2010, up 19.2 percent from 2009. Demand is expected to grow by at least 3 percent this year, she said.